New to baking? 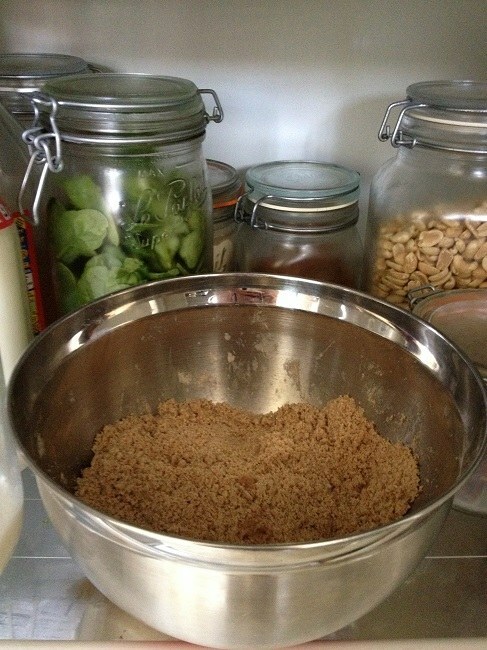 Or long-time baker turning to whole wheat, whole grain recipes and feeling a little intimidated? You can make delicious, moist, tender 100 percent whole wheat biscuits and scones with that delicate, airy texture we love. On this page, I show you how, step by step. But first, let’s look at some of the differences you can expect between white flour and whole wheat biscuits and scones. If you love those giant, pillowy, white flour biscuits they serve at restaurants slathered in red-eye gravy, you may feel a little disappointed the first time you set eyes on a whole wheat biscuit. Here. Try one. They’re still warm. Right away, you notice they’re not as high as restaurant biscuits. With 100 percent whole wheat flour, you won’t get that super loft, in part because we’re not using the self-rising flour many restaurants–and recipes–use to obtain that extra lift. The second thing you notice is that whole wheat pastries are not as light in color as their white flour cousins. Stands to reason, right? It’s the “whole” in the flour that gives whole grain biscuits and scones their darker, richer color. More on that coming up. For now, let’s take an imaginary taste test. How’s it going to taste? Will we like it? Go ahead. Pick up that whole wheat biscuit. Just look at that moist, flaky interior! Give it a sniff and a nibble. Catch that richer, scent? Feel that textured crumb on your tongue? Take a bigger bite. Wooler it around in your mouth a bit. Feels a bit crunchy on the outside, doesn’t it? Moist and buttery inside. But it’s what happens to your taste buds when you eat a whole grain pastry that really shows the difference between white flour and whole wheat: Flavor! You’re tasting a depth of nuanced flavor not possible with white flour. No need to slather these puppies with gravy, and no gluey stuff sticking to the roof of your mouth as you chew, either. Who knew? Right? Once you learn how to make 100 percent whole wheat pastries that are lighter and airier than any you’ve tried before, you may discover you love them more than ever you did those tall, floury, biscuits that go kind of gummy in your mouth. Why is whole wheat flour darker and heavier than white? Whole wheat is nothing but wheat berries, ground fine. 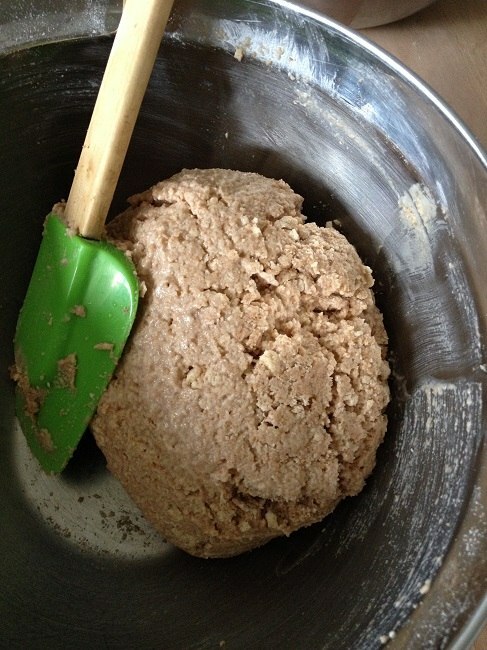 White flour is what’s left after you sift out all the high-protein wheat germ and the fibrous bran. Oh, and to get that snowy whiteness, the manufacturers bleach your flour. Not only do they bleach the flour, but they add various chemicals to it, to make it behave certain ways and to help it rise higher. We’ll talk about those additives another day. So yes, your whole grain pastries possess flavor and texture qualities you can never get in a white flour pastry. That’s a good thing, because it means your flour has essential vitamins and minerals that white flour doesn’t have. 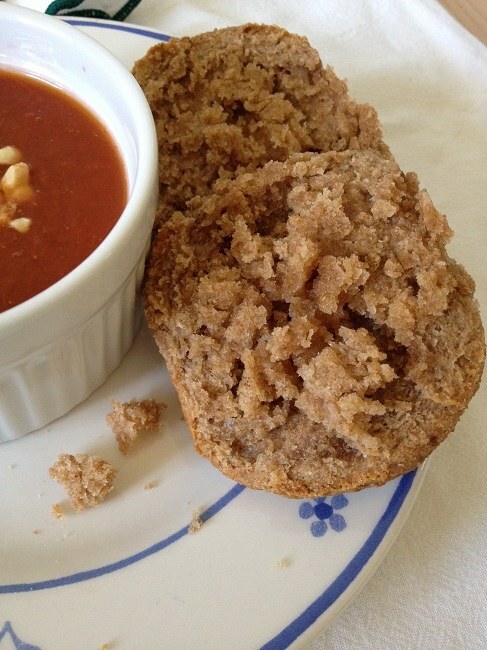 Ready to learn to bake with whole wheat? Let’s get started. If you’re a long-time baker just turning to whole wheat, you will find lots of familiar steps here, along with a couple that will make your dance with whole wheat a little less like beginner steps and more like picking up the tango after a lifetime of waltzing and fox trot. If you’ve never baked before, or very little, you will find some of these steps helpful with every baking adventure. Because most of these steps work equally well with both biscuits and scones, I’ve incorporated both in this tutorial. Scones need a little different handling–not much–so you will see a few extra photographs showing those steps. Step 1. Start with a good recipe. This is mine. 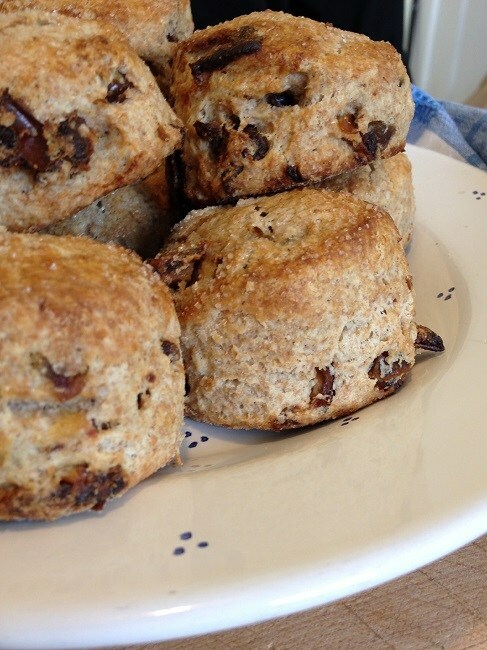 I use this basic recipe as the starting point for all my biscuits and scones. This recipe uses yogurt for the liquid. I prefer a cup of real yogurt (the kind that has no pectin) for the liquid because whole wheat flour pastries turn out fluffier and flakier with it than with milk. If you have to substitute milk, use about 3/4 cup, or your pastry dough will be too wet. 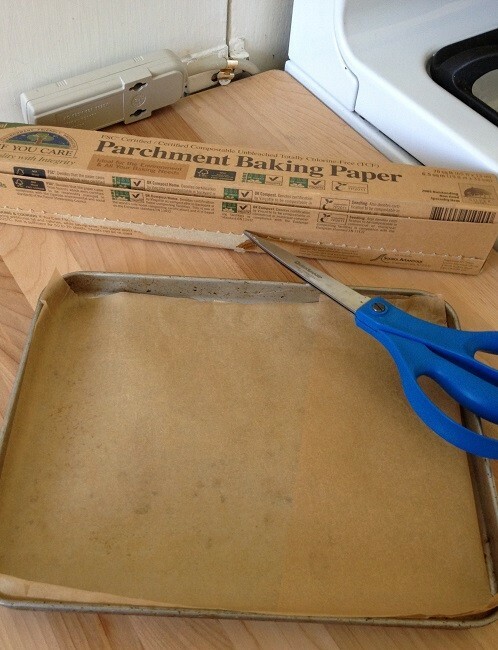 For scones, line a large baking sheet with baking parchment. For biscuits, line a small baking pan. Whisk dry ingredients by hand in a medium sized bowl, or mix in food processor. Cut in chilled butter cubes by hand with pastry blender, or pulse with dry ingredients in food processor, until largest pieces are size of small peas. 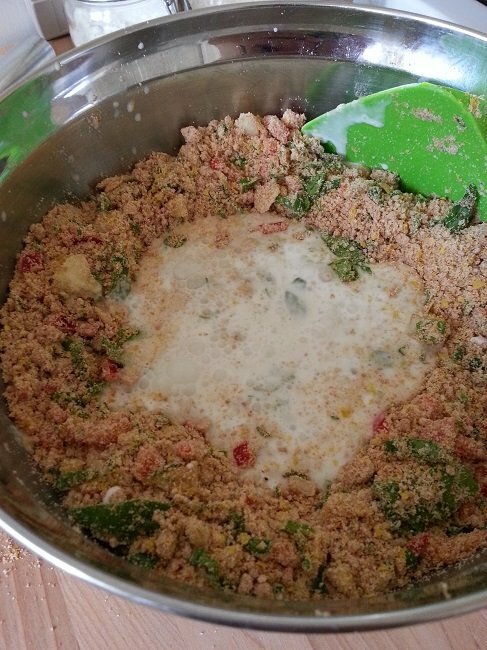 If using food processor, dump all into a medium mixing bowl. Make a well in the center and pour in yogurt or milk. Fold carefully until dry ingredients are just moistened and will hold a ball shape. Carefully dump onto lightly floured work surface, sprinkle top lightly with some of the reserved flour and knead dough gently 5-6 times. Dust top again and roll out to 3/4 inch thickness. 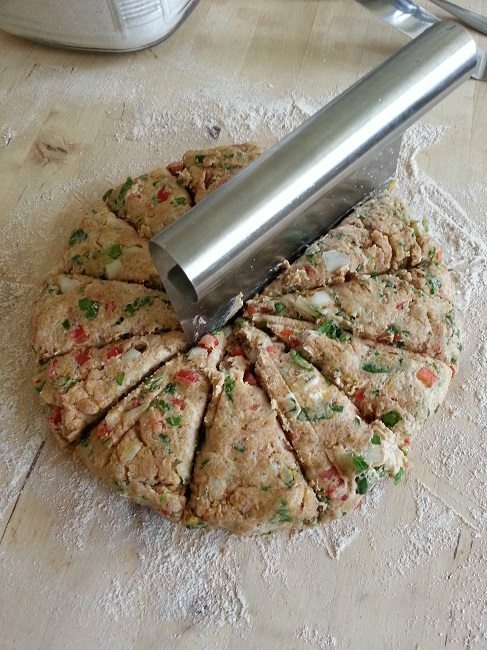 For scones cut with knife into 12 triangles or use 1-1/2” biscuit cutter to make twelve round scones. Place on lined baking sheet 1-2 inches apart. 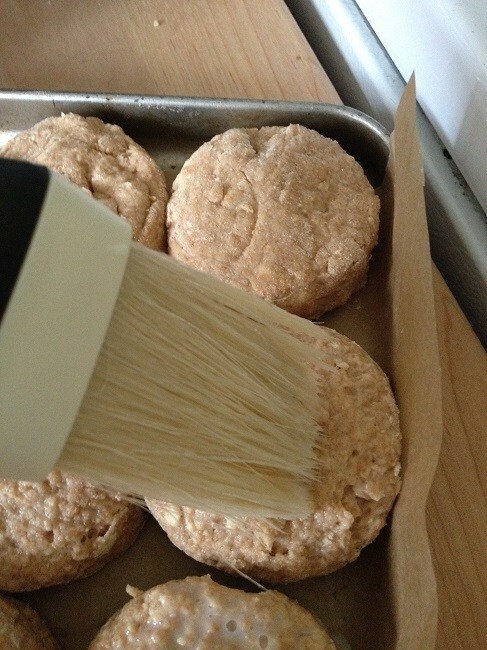 For biscuits, cut with 1-1/2” biscuit cutter and place on small baking pan, edges touching all round. Dust tops lightly with some of the reserved flour or brush with your preferred pastry wash to give them a caramelized glow. Bake on middle rack at 450 F for 20 minutes. Do not over bake. Pull from oven and set pan on cooling rack for five minutes, then lift pastries from pan to cooling rack. These are so rich that we eat them plain, without added butter or jam, while still warm. Reheat leftovers in a toaster oven (one of the reasons I couldn’t live without one). Just toast lightly, enough to heat through without scorching. The right tools make baking day fun and easy. These are the ones you need. I’ve listed items you can use as substitutes in parentheses. I encourage you to invest in the real deal as soon as you can. I can’t tell you how many times I jumped up to try a new recipe, dove right in, and fifteen minutes later, my hands covered in flour and dough, realized I hadn’t prepared the pan or taken the pans that live in the oven out so I could preheat it. Take the time right now. You’ll need a small pan for biscuits, a larger one for scones. That’s because we bake biscuits close together, with their sides touching. We bake scones separately, spread out like cookies, about one inch apart. If making biscuits, pull out a small pan that will hold twelve 2-inch biscuits, touching each other, and line it with baker’s parchment (optional). The baking pan that came with your toaster oven does the job nicely. So will a cake pan, skillet or even a pie plate. If making scones, pull out a regular cookie sheet or jelly roll pan that will hold twelve triangular-shaped scones, about 2 inches wide by 3-1/2 inches long, and spaced about 1 inch apart; line it with baker’s parchment (again, optional). It saves so much on the cleanup end. Waxed paper will melt, so you can’t substitute that. Foil changes how the pastries bake, so I don’t recommend that either. 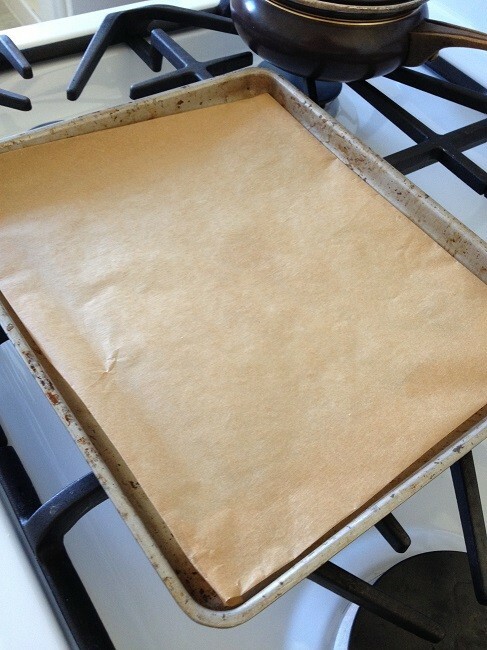 For some time, I used a Silpat silicone baking mat, but I had to use so much soap and water to wash it multiple times after each use that I realized one-use baking parchment would be less harmful to the environment, overall. For lowest environmental impact, choose the unbleached kind made from recycled paper. Assemble the ingredients called out in your recipe on a ready tray so all are at hand. That way, you don’t find yourself scrambling for a substitution or having to make a run to the corner grocery half way through the mixing and stirring. When making biscuits and scones, you will always need the following ingredients. Some recipes may also call for one or more of the following ingredients. These are extras that go into some of my shortbread recipes–not all at the same time, of course. 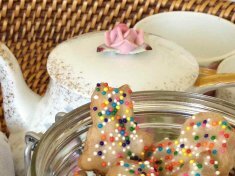 Shortbread: Quick breads and pastries that use baking soda, baking powder or a combination of these, sometimes with other agents such as buttermilk, to help them rise. If your recipe calls for butter or lard, cut it into 1/2-inch cubes while the brick is cold. It’s easier. Let the cubes soften to room temperature. 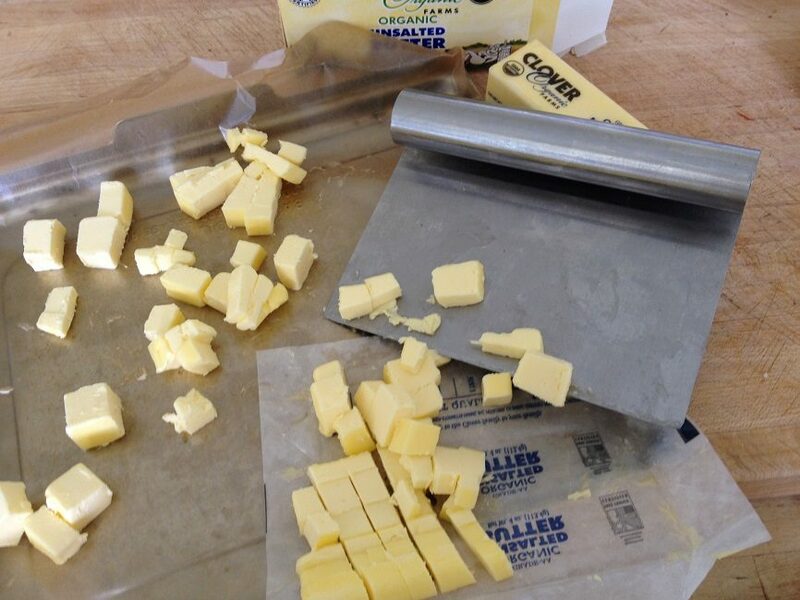 If you’re in a hurry, see my easy method for cutting and softening butter. Now, if you’re an old-hand at baking, you’re wondering why I suggest softening the butter before adding it to the flour. 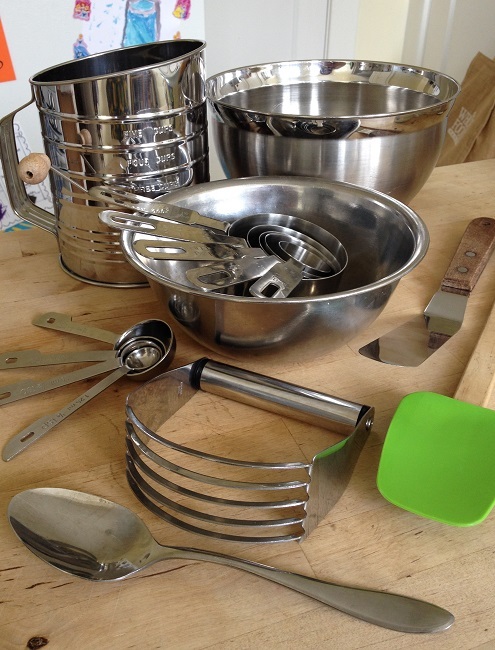 After all, the first rule to tender pastry making is to chill all the ingredients–and the bowls and utensils–right? Well, I learned this trick from blogger Maria Rodale when I was perfecting my whole wheat pie crust recipe: For an even flakier pastry, start with room temperature butter, cut it in, then chill the flour-fat mixture 30 minutes before proceeding. Yes, it adds time to the overall process, but it’s worth it because you get a tender, more flaky pastry! 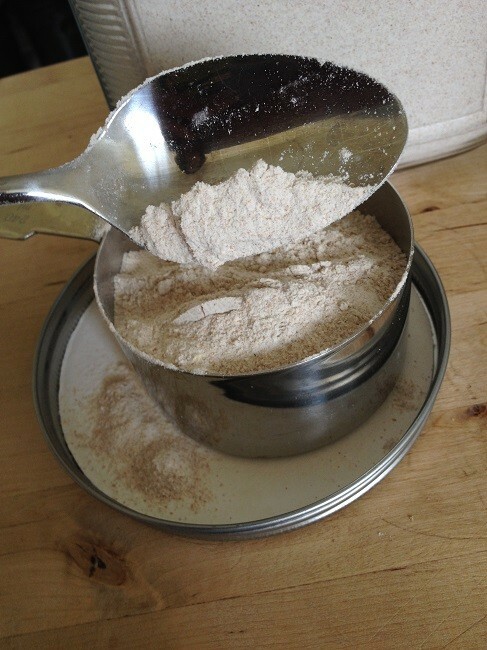 Spoon your flour into the measuring cup. 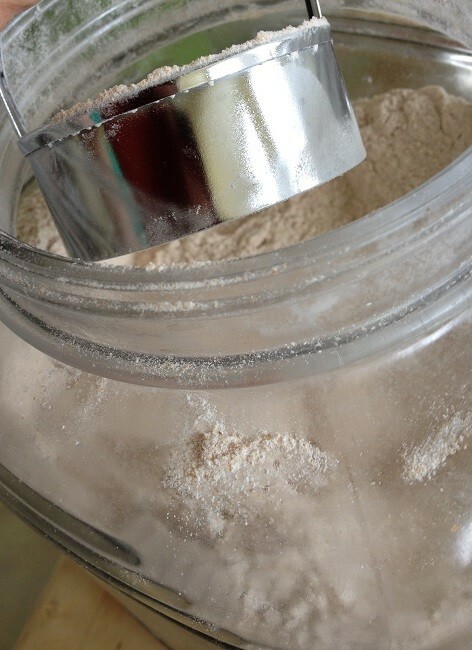 This helps to aerate the flour, which is especially important in obtaining fluffier whole wheat pastries. Fill the cup to overflowing. 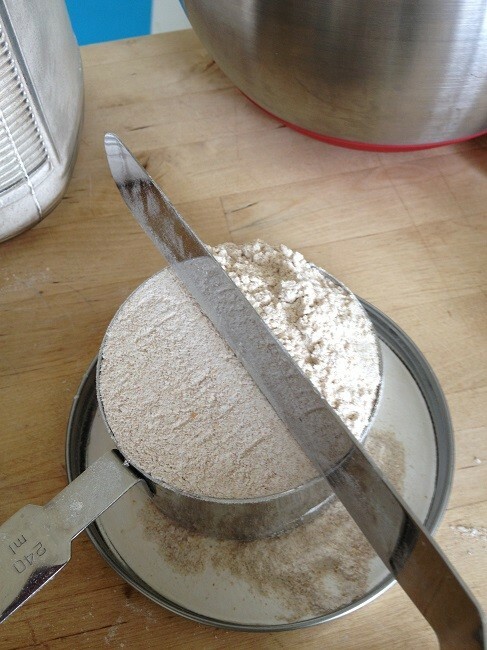 Using a straight-edged spatula, scrape off the excess flour, leveling to the top of the cup, nice and flat. 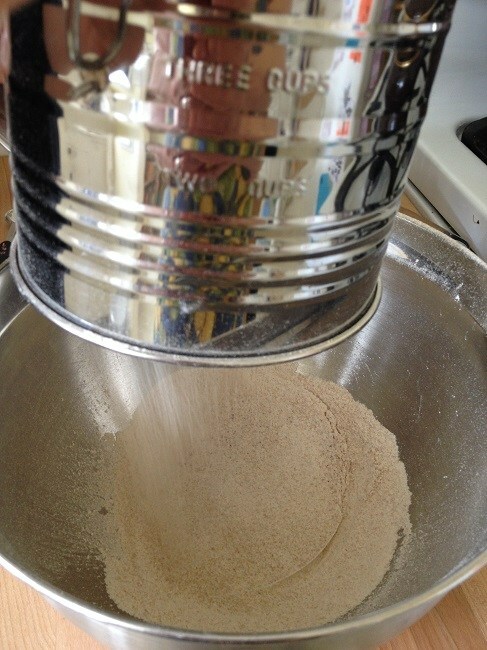 Place your sifter over the small bowl and pour the first cup of flour into the sifter. Measure remaining flour exactly the same way. Sift the flour into the small bowl. 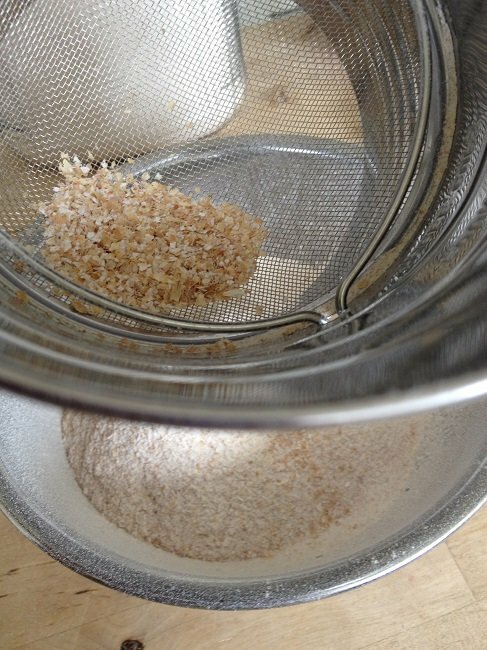 You will find a tablespoon or two of bran in the bottom of your sifter. We like this stuff! It’s good for our bodies. Dump it into the bowl with the flour. Step 7: Sift together the flour and remaining dry ingredients. Place your sifter over the medium mixing bowl. We are going to sift the flour a second time. 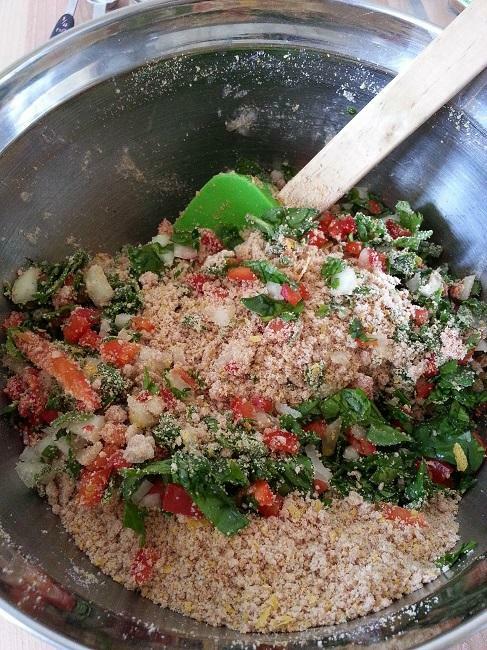 This time, we will sift it with the other dry ingredients, including any ground spices called for in the recipe. 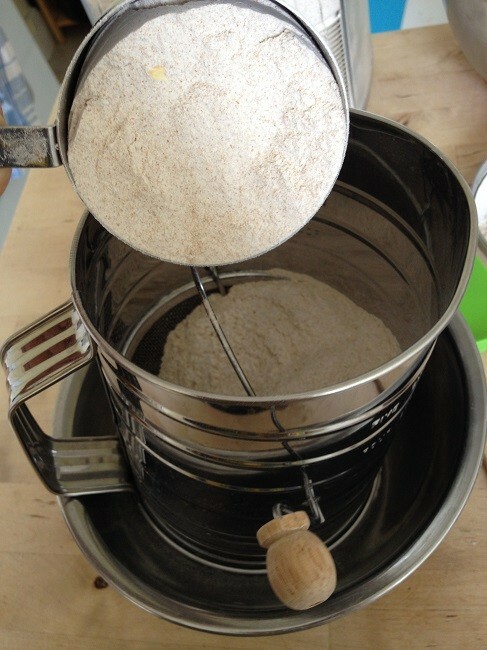 Sifting twice further aerates and distributes the added ingredients throughout the flour. 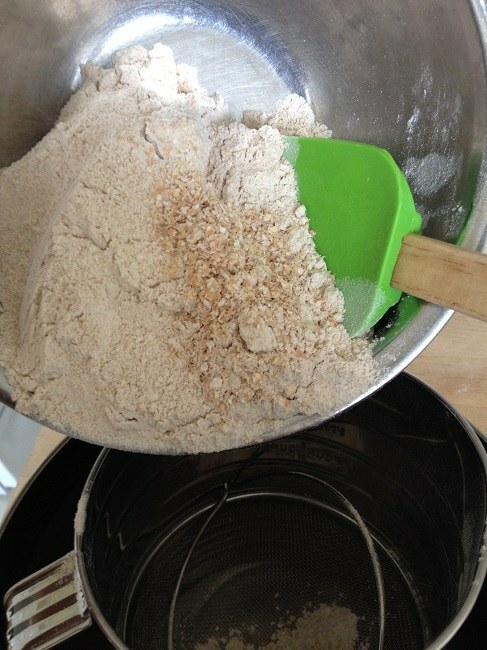 Pour your once-sifted flour into the sifter and measure the remaining dry ingredients right on top. 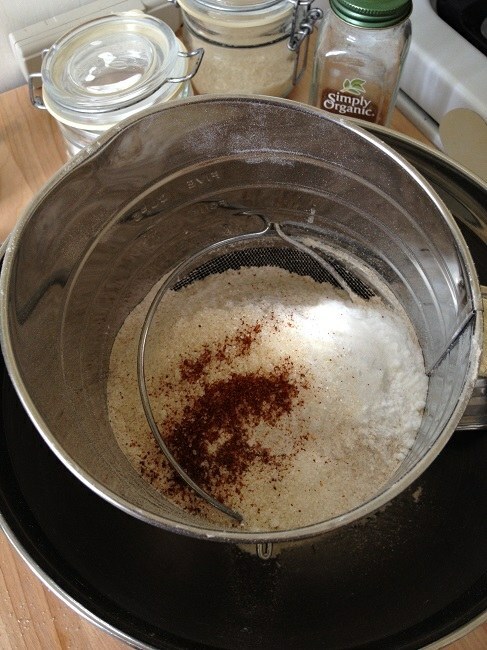 Sift flour and other dry ingredients together into the mixing bowl. If you are making vegan pastries and using coconut oil, press it into a measuring cup and level off, as we did with the flour. 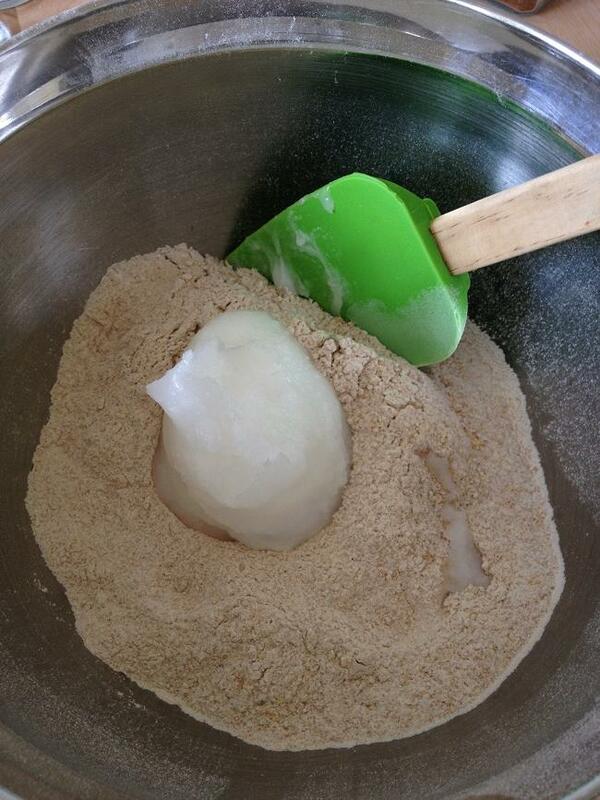 If you are using butter or lard, your cubes should be softened by now and ready to add to the dry mixture. Whichever fat you choose, add it all at once to the dry mixture and gently stir to cover exposed fat edges with flour. Do not mix! 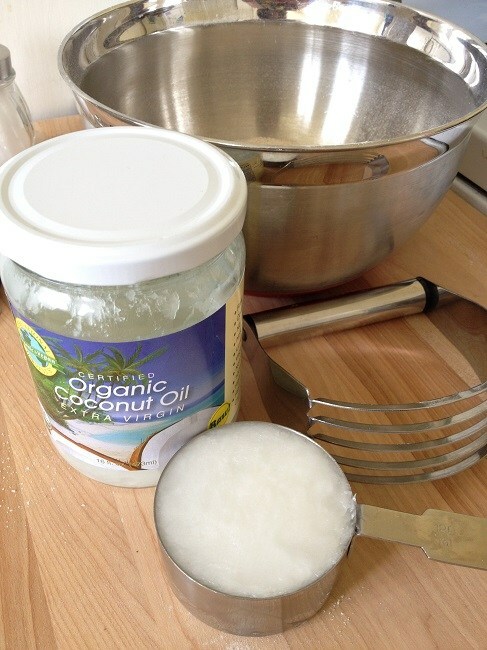 A note: Some recipes avoid saturated fats altogether and use vegetable oils. So far, I have not obtained the delicate biscuits and scones I want using oil, so I do not include that option in this tutorial. Using your pastry cutter or two knives, quickly cut the fat into the flour until the mixture looks something like corn meal in texture and the largest pieces of flour-covered fat are about the size of small peas. The easiest cutting method is to use a stainless steel pastry cutter with a curved row of knife edges attached to a sturdy handle. Rock the cutter up against the edge of the bowl and back down into the center of the bowl, maintaining contact with the bowl throughout the motion. While cutting the fat, rhythmically turn the bowl a quarter turn, so you move through the flour and fat evenly. If you don’t have a pasty cutter, you can use two knives. Hold them like swords, slightly across one another and cut with a crossing motion, one knife against the other, turning the bowl often, until you have cut all the fat into the flour as noted above. The pastry cutter method takes 2-3 minutes at most. The knife method takes a little longer. How about using a food processor? 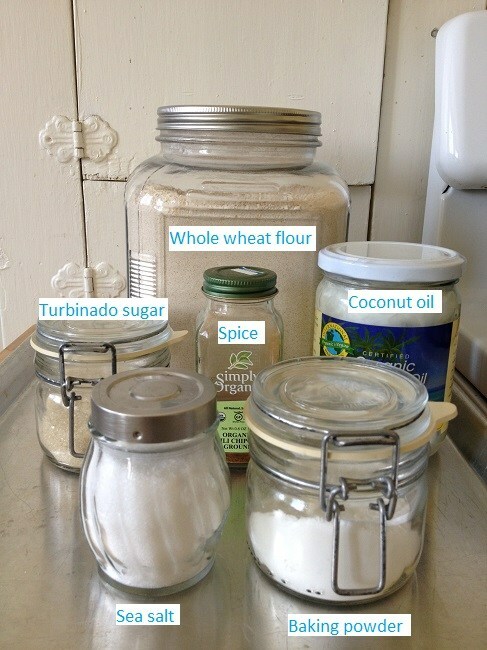 You can use a food processor to mix the flour and cut in the fat. If you have arthritis, this may be the best option. Use the pulse button and check the mixture often so you don’t over-process. Given the extra clean-up time, I find it’s actually quicker to mix and cut manually. Step 9. Chill the mixture 20-30 minutes. If adding fruit, nuts or vegetables that need chopping, prepare and measure them while you wait. 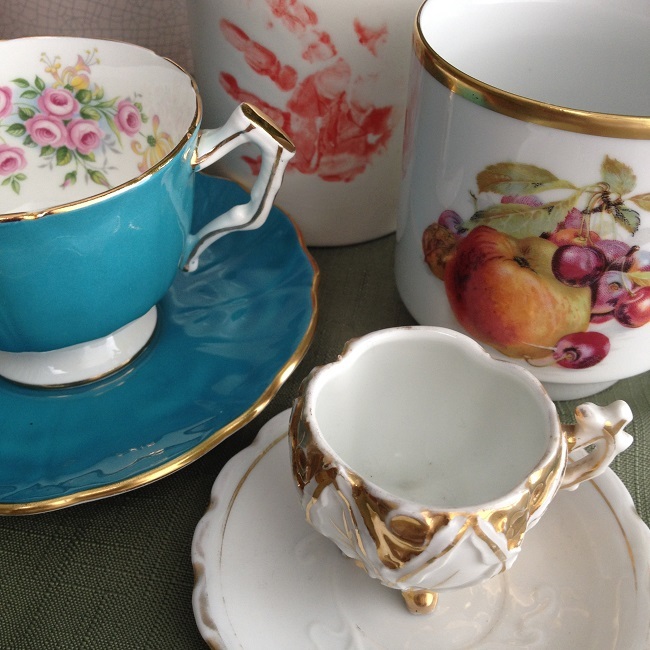 Or just have a nice cuppa and relax a few minutes. 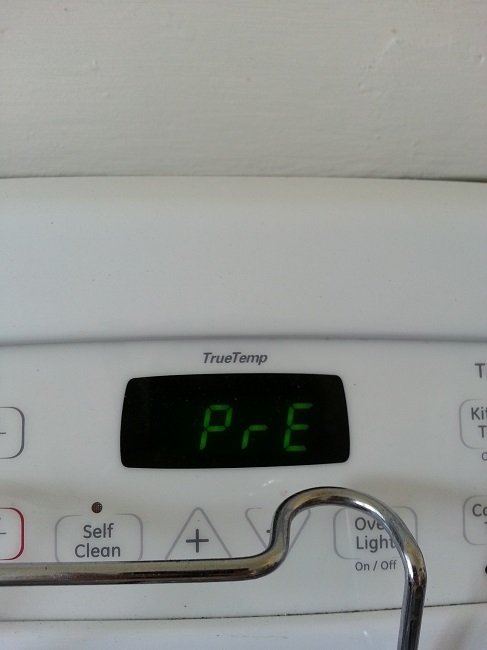 At the end of the chill period, preheat your oven to 450º Fahrenheit (F). Double check that nothing is in the oven (you can tell I’ve had a problem with this a time or two). Step 11. Add any extra ingredients, if recipe calls for them. If your recipe calls for extra goodies, such as grated cheese, fruits, seeds, nuts, or veggies, stir them in gently to coat with the flour mixture and distribute throughout. Step 12. Add the liquid and mix just until flour is wet. 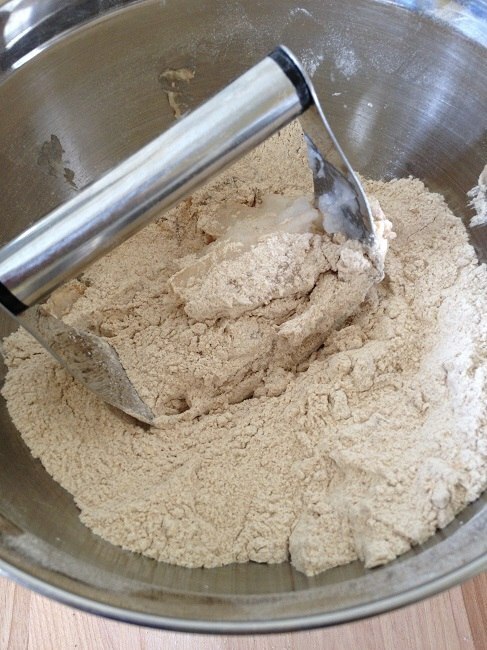 Make a well in the center of the flour mixture and pour the measured liquid into the depression. 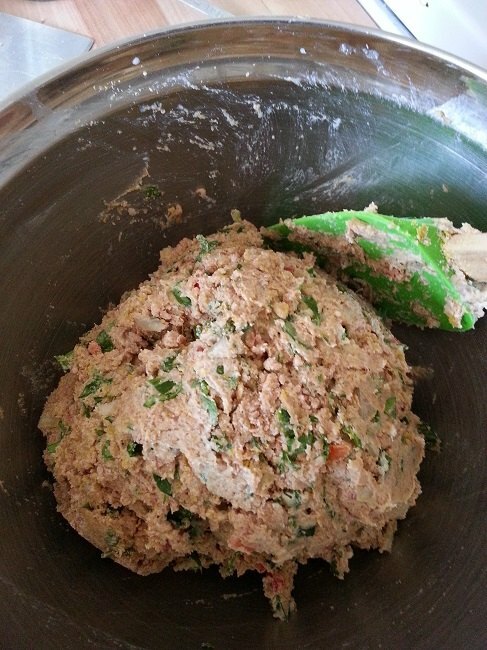 Fold the flour mixture into the liquid until it is just moistened through. Do not over mix! Step 13. 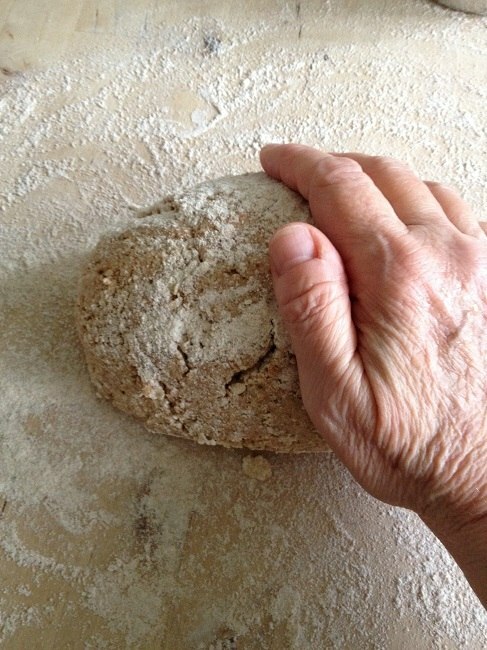 Turn dough onto floured surface, shape and cut. 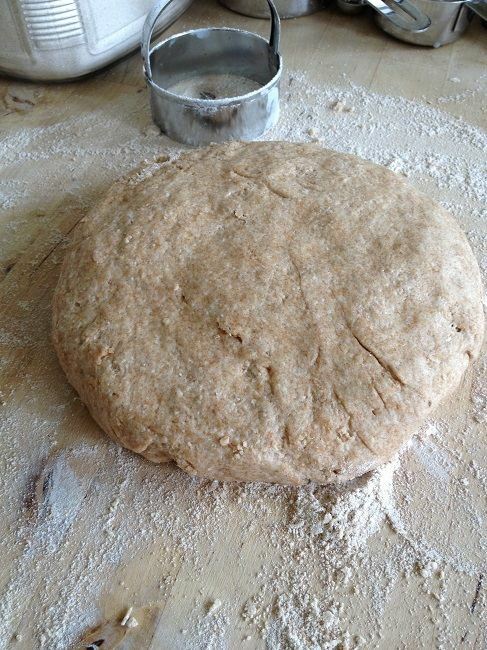 With dough in the bowl, gently shape it into a ball and turn out onto a lightly floured cutting board. 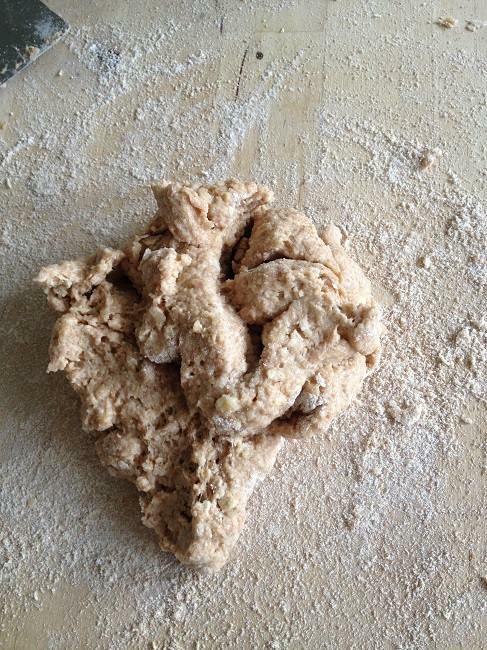 Here’s how the biscuit dough looks before turning it out on the board. If the dough is sticky, sprinkle a little flour over the top. With cool, dry hands (if you’re menopausal like me, or just run hot, it helps to run them under cold water, but do dry them thoroughly), knead ball 5-6 times, then pat into a flat round about one inch high. Of course, if I weren’t holding the camera with one hand, I’d knead with two hands, and well, I’m a little embarrassed. Where did all those wrinkles come from? Don’t worry about perfection. Fast is what matters at this stage. Biscuits like a little rough edge here and there, but they don’t like to be worked. Yahoo! We’re ready to cut our dough! 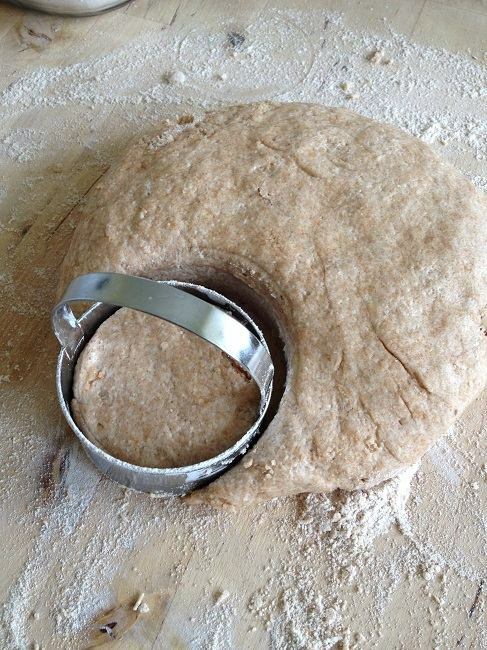 To prevent sticking, dip your biscuit cutter into your flour bin. Cut a few rounds. If the cutter begins to stick, dip in the flour bin again. Place the biscuits in their baking pan so they touch either the sides of the pan or one another on all sides. Gather the scraps and carefully roll them into a ball. Flatten to a 1-inch deep round once more. Cut another biscuit or however many you can. Shape the last bit of dough into a biscuit shape and add to the pan. Using a dough scraper or large pizza cutter, score the round to make twelve triangles, each about the same size. Once scored, cut through to the board and lift each triangle gently to the baking pan. This is another time that a long metal spatula comes in handy. Space the wedges one inch apart on the baking pan. They’re not perfect, right? Hey, that’s why celebrity chefs get the big bucks! No worries, though. These scones will be gorgeous when I pull them from the oven. Some folks like their biscuits dusted with flour on top. That’s fine. We like ours that way sometimes too. Most of the time, to get that extra golden bakery glow, just before popping our goodies in the oven, I brush them with a wash. Egg washes do it best, but if I’m in a hurry, don’t want to mess with the egg, or am baking vegan, I use a different solution. If I’m in a hurry and just want to get those babies in the oven, I reserve a tablespoon of the liquid I used in the recipe, dissolve a little granulated sugar in it, and brush that lightly on my pastries. The sugars–milk and granulated–give my pastries a little extra golden browning, which is enough for just us. This works almost as well with coconut milk as it does with cow’s milk. I add a little more sugar to the coconut milk. 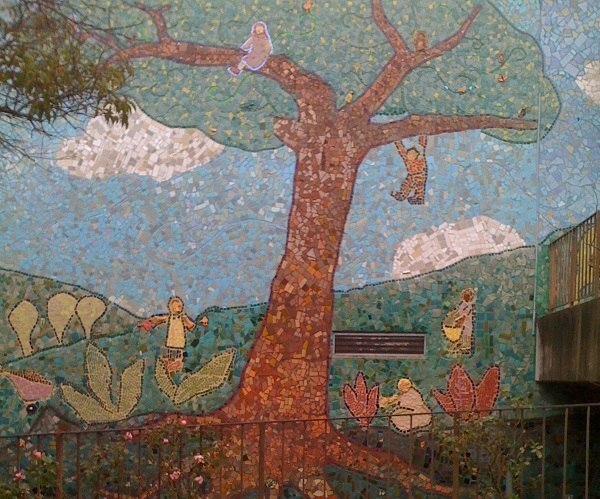 In the photo above, take a look at the biscuit in the lower right corner. You can see the milk puddling there. That’s a mistake. I didn’t shake enough milk from my brush. You want just a little moisture skimming the surface, as you see on the next biscuit. Tip: If you use less-refined turbinado sugar like I do, toss the sugar in the reserved milk right after you add the rest of it to the flour mixture. 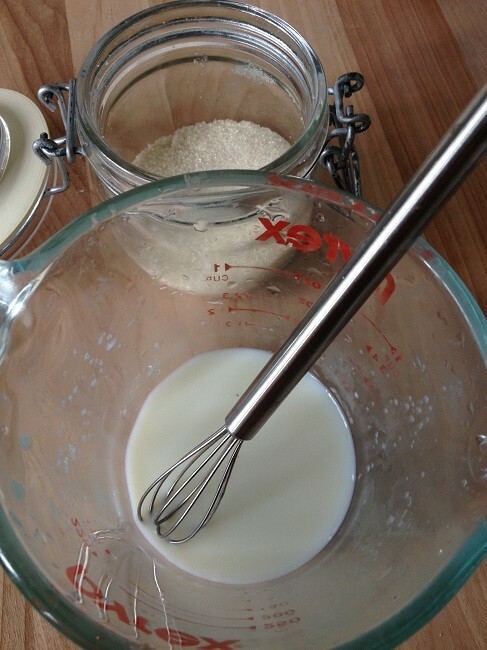 By the time you’re ready for the wash, the sugar will have dissolved and all you’ll need is a quick whisk. When I want to be fancy for company, and sometimes just for us, because we deserve an extra step now and then, I make an egg wash. You get a different glaze with egg washes, depending on whether you use the white or the yolk, as well as how you prepare them. Here’s a link to a wonderful quick and easy chart for the different washes you can use and the effect they will have on your pastries: Egg Wash by NovaGirl on Have Dessert First. Even though she titles her article “egg wash,” NovaGirl includes vegan alternatives as well. Step 15. Bake those puppies! Pop the tray or pan into the oven and bake 20-30 minutes, depending on your oven, until golden brown. When the pastries are ready, remove from oven and set the tray on the cooling rack to rest for five minutes. After the rest period, use a spatula to lift your goodies from the baking pan to the cooling rack and let them cool a bit longer if you plan to serve them right away, or completely, if you plan to store them for quick breakfasts on the run during the week. Hot, fresh-made biscuits so tender and moist, you don’t need butter or spreads! 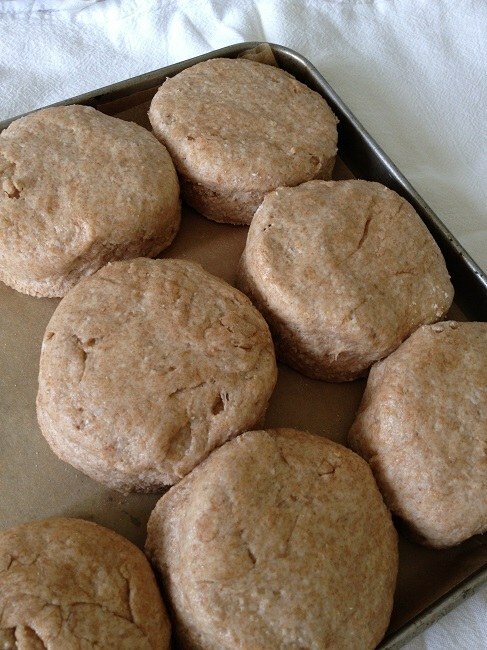 Whole wheat scones and biscuits made with fresh ingredients will go stale quickly if not stored properly. I store mine in Fido or Le Parfait jars. The rubber seals on these jars keep them fresh for days. I think the leftovers are best toasted in the toaster oven on light for a few minutes. Can’t you just feel this scone melting in your mouth? My sweetheart likes them room temperature and grabs a couple, savory or sweet, along with a jar of homemade yogurt and a piece of fruit and carries them to work for a quick breakfast or snack. Ready for a another bite? 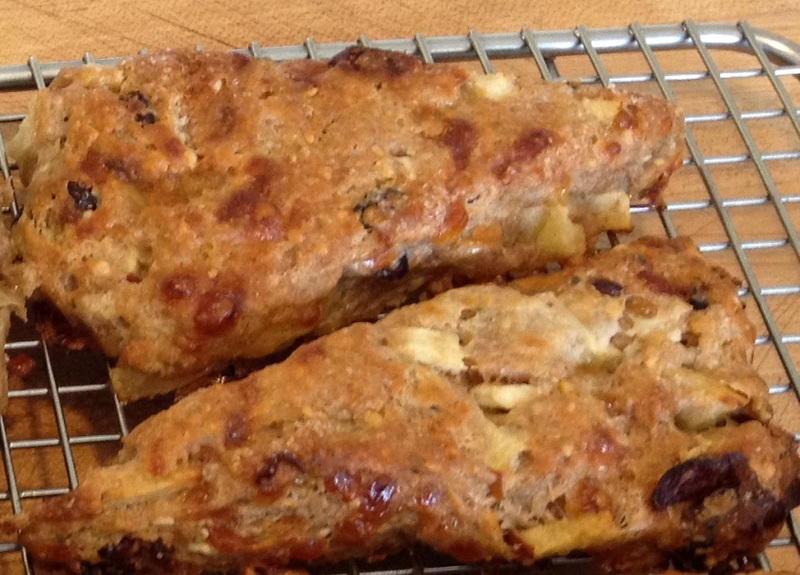 Try these whole wheat date and walnut scones. Grab a couple! Let’s chat. 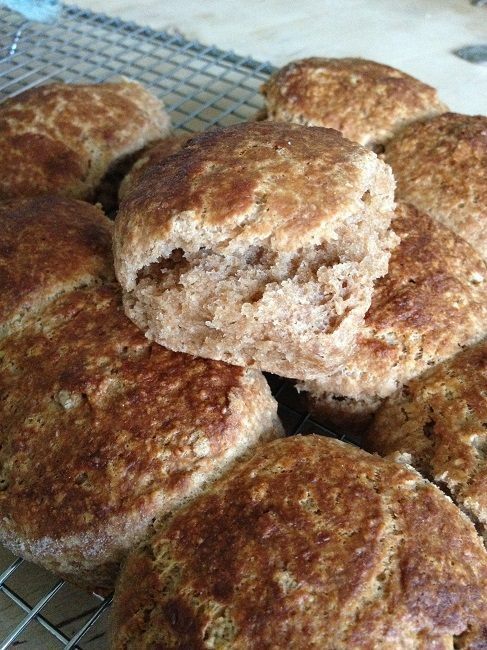 Have you made whole wheat biscuits and scones before, or is this your first time? How does the tutorial work for you? Did I leave anything out? My goal is to make this tutorial detailed enough that you have all you need to bake wonderful whole wheat pastries at home, but not so complicated that it boggles the mind. Please, use the comments below to tell me how the tutorial works for you, because I never forget that everyone is different, and everyone sees and hears things differently, too. If I can make this guide better, I will. So go ahead, fire away with the questions already. 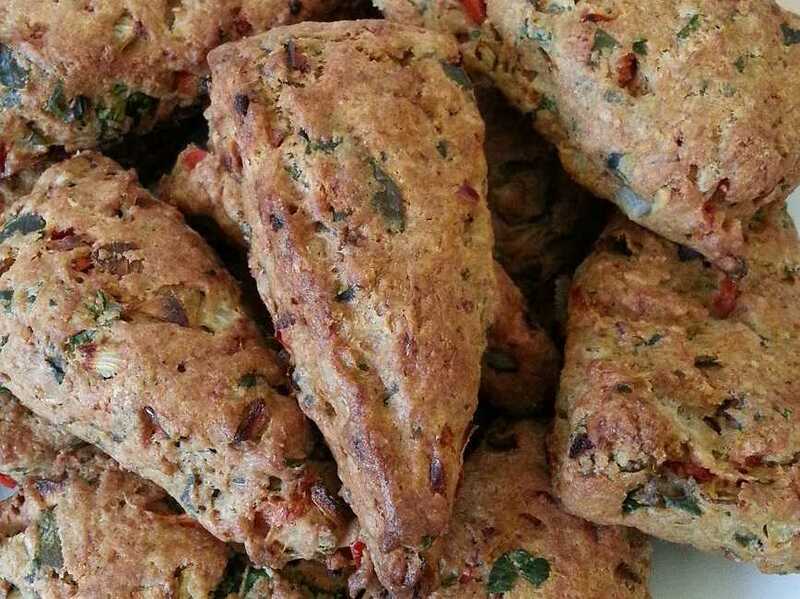 Very good tutorial and I would like to make the scones. But where is the recipe? Quantities? Thank you Robert and welcome! I apologize that the tutorial did not include my basic recipe. I will rectify that as soon as possible. 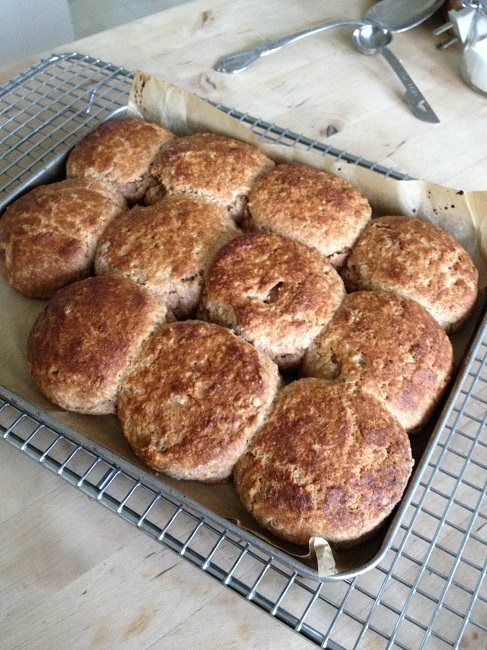 Thank you so much for linking to my whole wheat scones recipe! I hope you enjoyed them as much as I enjoyed your article. I’ve pinned it so I can return again and again, when I need the reminder. Thank you Pat! I will. You can be my tutorial tester! Give it a try and see how they turn out. Oh, my dear, you do have a way with words. I thoroughly enjoyed reading this, and found the first lesson of your “101” series exceptionally good. The directions are clear and concise. There’s no room for anyone to misunderstand anything, and that is so important. I can’t wait to be done with this low-carb thing (I’ve lost 6 lbs!) so I can make some of your recipes. By the way, do you think I have any chance of success with my red velvet cake recipe (still on HP, but not for long) if I were to change to whole wheat flower? I currently use cake flour. That’s about the only thing where I still use white flour. For everything else, I use only unbleached flour, but I still want to move on up to whole wheat and whole grain. Maria, you gladden my heart with your kind words. I make all my cakes, including my holiday pound cake, with 100 percent whole wheat flour. I have not made a red velvet cake, though, and I know that people who crave that cake are quite particular about its texture, so I couldn’t say whether a whole wheat version would please. For some cakes, I add an extra egg, to give them a little extra loft. If you’re using cake flour and switch to whole wheat, you’ll need to make an adjustment with the leavening too, since cake flour contains agents to help it rise. 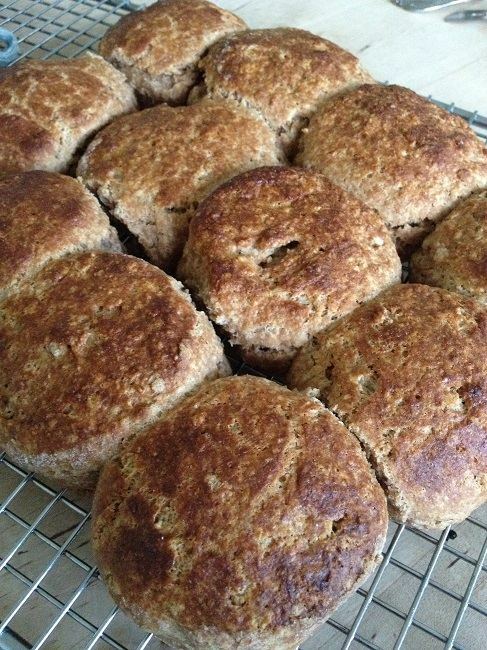 If you try a whole wheat version, let me know how it turns out. I’ll do that. Thanks for the additional info. I make it mainly for special occasions such as Christmas, Thanksgiving, Valentines, and birthdays. I think I will need to make one as an experiment. I may be asking for more advice when I get ready to enter my “lab”.